Is your significant other too cheap to woo you? Want to forget the whole romance thing and just have a night out with a friend? Either way, the library has got you covered. We’re giving away two free movie passes and a $25 gift card to Applebees. How do you win them? 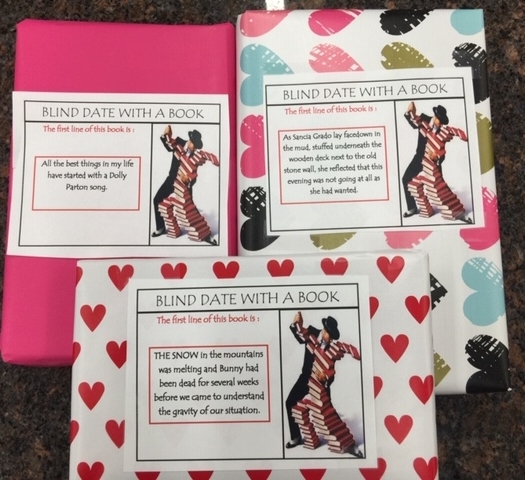 By entering our Blind Date With a Book contest! Come into the library and pick out a wrapped book from our display. You won’t know the author or title of the book but you will be able to read the first line. Pick the one that most appeals to you, take it home, read it, and fill out a “Rate Your Date” card when you return it to enter into the drawing and a chance to win. Please note that each person can have a maximum of three entries and that all entries must be submitted by 6:00pm on Thursday, February 28. Good luck!